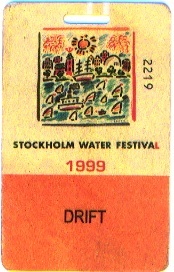 The Stockholm Water Festival is a major event in Sweden. The Swedes have an annual holiday period from the beginning of July till the middle of August when almost everyone takes holidays and business, especially heavy industries and construction, comes to a virtual standstill. The water festival is timed to take advantage of this and draws crowds from all over Sweden, Norway, Finland and other parts of Europe and the UK. Most of the downtown core is closed to vehicle traffic with massive stages being erected in parks and waterfront parking lots where many famous names perform nightly. The streets and bridges are lined with vendor tents where once can sample exotic foods from around the globe, buy clothing, pins, flags, trinkets toys or even take a scuba diving lesson in a floating swimming pool. Barges are towed in and converted to floating restaurants and bars where you can enjoy a meal or drinks while bobbing gently on the water. The festival celebrates ecology and the water in and around Stockholm which is an integral part of the city and it's life. A special 80 meter high fountain is installed for the event (picture below right), there is an emphasis on water based events such as the water-skiing show, and there are even "hydro bikes" on pontoons that allow one to go for a leisurely pedal on the water. In keeping with the ecological theme, food vendors use paper plates and cups and cutlery is made from wood. Even the crew passes (picture on left) are made of a thin slice of wood printed with non-toxic inks! There is an environmental organisation in Sweden that gives out an annual prize for the cleanest festival. Garbage containers are located everywhere around the site and garbage collectors patrol the streets picking up what litter is not placed in containers. As a result, the festival area (which attracts over 100,000 visitors a day) is cleaner than the streets of New York are on an average day. This concern for ecology and the environment was the genesis of the nightly laser presentations. Concerned with the effects that the toxic chemicals from spent shells of the traditional nightly fireworks displays was causing to the water, the organisers sought a replacement spectacle to entertain the crowds of 30,000 to 40,000 people per night. Enter Jan Kriland and the laser saga "Urstr�m". Urstr�m is a Swedish play on words. The first part (Ur) means "original/ancient", while the second part (str�m) means "current" which could either be a current in a waterway/river or an electrical current. This report covers not only the technical and artistic aspects of the show, but also contains a day-to-day diary of the show written from the perspective of one of the members of the crew who helped realise this magnificent spectacle. The laser saga Urstr�m entertained an estimated audience of over 300,000 people during it's 9 night run at the Water Festival. In order to present as many pictures as possible, we have broken this special report down into a number of pages to speed access. Most of these are large pages with many images so please be patient while loading.